As we all prepare for the holiday parties we’ll be hosting or attending in the coming week, let’s take a moment to be grateful for our Katy and Houston area homes, and to remember those who lost their homes this year to Hurricane Harvey. As your Katy real estate agent, I’d like to fill you in on the details of the Hurricane Harvey Benefit Concert coming up this Saturday! 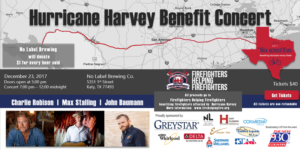 No Label Brewing Co. in Katy, TX is hosting a Hurricane Harvey Benefit Concert this Saturday, Dec. 23, from 5 p.m. to midnight. Tickets cost $40 and all proceeds from ticket prices will go straight to Hurricane Harvey Relief. No Label Brewing is also donating $1 for every beer sold to Hurricane Harvey Relief as well, so drink up! There will also be food available for purchase from food trucks Mingo’s, A&B Ringmasters and Curbside Sliderz. Live entertainment for the evening will begin at 7 p.m. and consist of Charlie Robison, Max Stalling and John Baumann. Charlie Robison is an American country music singer/songwriter, Max Stalling is a Texas country music singer/songwriter, and John Baumann is a Texas country singer. So put your cowboy boots and hats on and enjoy a classic night out in Texas, right before the holidays! If you have holiday plans and can’t make it to this fundraiser, but still want to help those in need this holiday season, you can donate right to the Hurricane Harvey Relief Fund as a one-time donation or a monthly donation. This is the perfect time of year to think of neighbors in Texas who were less fortunate than you this year. As your Katy real estate agent, I hope you have a joy-filled holiday season in the coming weeks! If looking for a way to ring in the New Year, check out this list of New Year’s Eve events taking place in the greater Houston area. You’ll be sure to find one that suits your fancy! Or, you could always host a party at your Katy home as well and make it a more low-key evening. When ready to accomplish your home-buying or home-selling goals in the Katy real estate market, contact me. What better New Year’s Resolution could you commit to than to make your real estate dreams a reality in 2018? I am here and ready to help you make that happen! I look forward to hearing from you. Does all of your holiday spending have you on a budget? 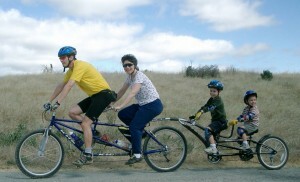 Not sure how to entertain your kids while they’re on break, or guests staying with you from out of town? As your Katy real estate agent, I’m here to fill you in on fun, free activities around Katy. Turns out, there are loads of fun things you can do with your family or friends in Katy that don’t cost a cent. 1. Visit a park. Katy is loaded with parks, and these are free to wander around and explore! Exploration Park has a sensory garden, musical bridge and a lawn with tall glass rods. Katy Play Station will keep kids busy for hours. Mary Jo Peckham Park has free putt-putt golf, a fishing pond and a playground. City of Katy Dog Park is 14 acres of water fountains, pools and trails for dogs! 2. Family Night. All of the Chick-fil-A locations host a Family Night just about every night of the week! These take place from 5:30 to 7:30 p.m. Lately, they’ve been holiday-themed, but other themes include pirates, indoor campouts, painting and more. It’s a great way to get out of the house and have old-fashioned fun. 3. Free Movies. Catch a free movie outside at LaCenterra at Cinco Ranch! Alamo Drafthouse Cinema hosts free movies on the courtyard on select Saturdays, which begin at dusk. Kids’ classics can also be found on Central Green on select nights of the week. These also begin at dusk. All you need is snacks and a blanket or chairs! 4. Museum Visits. Katy Heritage Society offers free admission at the historic homes in Katy Heritage Park on the first weekend of every month. Katy Contemporary Arts Museum has free admission every day that they are open, Wednesdays through Sundays. Katy Veterans Museum is also free to view Monday through Friday. 5. Story Times. Cinco Ranch Branch Library has free pajama story night every Tuesday from 7 to 8 p.m. Katy Budget Books has story time for kids’ age three to six, and book clubs for middle school students and young adults. Kindergarten kids meet at Kinder Korner on select Wednesdays for story time, movies and crafts. Maud Smith Marks Library hosts Teen Time on Thursdays from 2:45 to 4 p.m.
6. Trial Classes. You can take one free class at many places around Katy if you never have before! Becky’s Academy of Dance offers anyone a free trial dance class, and you pick the style. Connolly Dance Arts offers one trial class of any dance style as well. Katy Kips Gymnastics Club offers one free class to kids and adults. School of Rock offers one trial musical lesson to kids and adults. As you can see, there are lots of ways to have free fun in Katy! Enjoy the rest of your holiday season, and when ready to accomplish your Katy real estate market goals in the New Year, contact me, your Katy real estate agent! Holiday Fun at LaCenterra at Cinco Ranch in Katy! If you plan on spending this coming weekend at LaCenterra at Cinco Ranch in Katy, finishing (or starting) your holiday shopping, good news! This weekend is also loaded with holiday events for the whole family to enjoy. Start your Saturday early with a morning run, and finish with family-friendly skits and songs. As your Katy real estate agent, I’ve created a holiday guide for you at LaCenterra this weekend. Get some holiday shopping done and have some fun! Hopefully you can fit both into your schedule. Get up bright and early and bring the whole family over to LaCenterra for the 4th Annual Gingerbread Jog on Saturday, Dec. 12! The 5K race begins at 8 a.m. The Kids 1 Mile Fun Run for kids, ages 12 and under, begins at 8:05 a.m. The 1 Mile Family Run/Walk starts at 8:10 a.m. So as you can see, there is something for everyone to participate in! The Awards Ceremony will take place after the races at 9:30 a.m., and kids can create an assortment of crafts and activities from 8 to 10 a.m. Proceeds benefit the Pregnancy Help Center of West Houston, so it’s great exercise and fun for a great cause! Feel free to wear ugly Christmas sweaters or Santa suits. 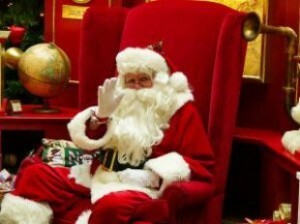 While shopping at LaCenterra on Saturday, bring your kids by the courtyard to visit with Santa! He will be there from 1 to 5 p.m. to meet with kids and hear what is on their Christmas list this year. Don’t forget your cameras too, so you can catch a great photo of your child on Santa’s lap! If you can’t make it on Saturday, Santa will also be there on Sunday from 1 to 5 p.m., and again next weekend. Saturday night, Parkway Fellowship is hosting their Jingle Jam for the whole family from 7 to 8 p.m. Head to Heritage Square for an hour of singing Christmas songs, watching funny skits and hearing the Christmas story. This is a great chance to meet and mingle with others in the Katy community as well, especially if you just moved to Katy. Enjoy your holiday weekend in Katy! There are plenty of other holiday events happening around town as well. Check out the Katy Magazine events page for more upcoming events. When ready to buy a Katy home, or when ready to sell your Katy home, contact me! As your Katy real estate agent, I can help you achieve your goals this year and next in the Katy real estate market. All you have to do is call me when you’re ready! Grand Texas Coming Soon to Katy, TX Area! For those of you counting down until the opening of the 610-acre, mixed-use theme park expected to open in nearby New Caney, don’t hold your breath. The Grand Texas Sports and Entertainment District’s opening date has been pushed back. As your Katy real estate agent, I’d like to keep you informed on the latest area news, and what to expect in the coming months. While it’s disappointing news that the opening date has been pushed back to anywhere from a few months to more than a year, it sounds like it’ll be worth our wait. Grand Texas will include a factory outlet mall, a 150-acre theme park, a 40-acre waterpark, an 83-acre Sportsplex, a 30-acre Speed-sportz Racing Park, an RV park with 144 lots, four hotels and 450,000 square feet of retail and dining in a “Downtown Texas” area. That is a ton of stuff all in one location! The first attraction to open is expected to be the RV Resort. Then the Sportspex will open and is expected to begin scheduling games at its indoor facilities and outdoor fields later this year. You can expect to see baseball, softball, soccer, lacrosse, football and rugby available at this new location. Big Rivers Waterpark will feature the largest wave pool in the Houston area, with programmable waves! It’ll also include a long lazy river, children’s slides and attractions, splash pad areas and extreme thrill-seeking slides. The waterpark will be the second largest in the Houston area, and after a few years of upgrades, it’ll be the largest. Grand Texas Theme Park will initially span 71 acres and will feature a wooden roller coaster, a family coaster, two extreme thrill-seeking coasters and a children’s coaster. There will also be 20 historic Texas-themed rides to enjoy, and an area with stage coach rides and boat rides. It’ll feel like traveling back in time! The full plan for all attractions is predicted to be executed by 2018 or 2019, but as explained, some attractions will be opening sooner than others. Once completed, Grand Texas is predicted to bring in hundreds of millions in sales tax revenue for the area each year, along with more than 10,000 jobs and 1.2 million visitors in the first year alone. So, while it’s a long wait for such an anticipated attraction, it sounds like it’ll do great things for the area! Not to mention, we’ll suddenly have ample amounts of new entertainment options available just a short drive from Katy. To learn more, visit the Grand Texas website. When ready to relocate to the thriving area of Katy, or when ready to accomplish your goals in the Katy real estate market, contact me! As your Katy real estate agent, I am only a phone call away and would love to help. Are You Familiar With LaCenterra at Cinco Ranch? As your Katy real estate agent, I enjoy updating Katy residents on local events, activities, businesses, real estate and all information available about Katy! I also like to feature different businesses and attractions around town. If you’re new to the Katy area, I’d like to fill you in on LaCenterra at Cinco Ranch. Cinco Ranch is one of the nation’s top-selling master planned communities, and LaCenterra resides inside the heart of Cinco Ranch. LaCenterra is a 34-acre, 300,000 square-foot development that is designed like a Main Street. It is located on the Grand Parkway, only three miles south of Interstate 10, so it’s easy to spot and easy to get to. 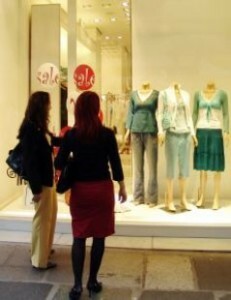 As a mixed-use development, you will find all sorts of well-known national retailers at LaCenterra, such as Talbots, Eddie Bauer, LOFT, Chico’s and many others. Restaurants include Bonefish Grill, Starbucks, Panera Bread, Grimaldi’s Pizzeria, Nothing Bundt Cakes and many more. There are also many offices that reside at LaCenterra. All sorts of different events and activities take place at LaCenterra! Heritage Square is where many of them take place, which is a central courtyard in LaCenterra. It’s the perfect venue for concerts, fundraisers and holiday celebrations, but it’s also just great for relaxing with a coffee or ice cream while taking a break from shopping or catching up with friends. Central Green is another common area for events to take place. It’s a half-acre public park, complete with an outdoor stage, large oak trees and lots of outdoor seating. Special events that take place at LaCenterra include summer festivals, job fairs, car shows, workout classes, holiday celebrations and plenty of shopping sales. If you need a job in Katy, Sephora is having a Job Fair this Saturday, July 25, beginning at noon. Then on Sunday, July 26, is Houston Family Magazine’s Summer Fun Fest from noon to 4 p.m. Family-friendly activities will include arts and crafts, face painting, inflatables, a rock climbing wall, live music and performances on stage, and free goodie bags for attendees. Admission and all activities are free! These are the types of fabulous community events you can expect to find at LaCenterra. Regular business hours at LaCenterra at Cinco Ranch are Mondays through Saturdays from 10 a.m. to 9 p.m. and Sundays from noon to 6 p.m. Take advantage of having so many shopping, dining and entertainment options in Katy, all in one central location, by stopping by soon and checking it out. If you are new to the Katy area and have questions about the community, contact me, your Katy real estate agent! If you’re ready to buy a Katy home, or ready to sell your Katy home, summer is a great time to do so. I’d love to help you out, so don’t hesitate to give me a call!